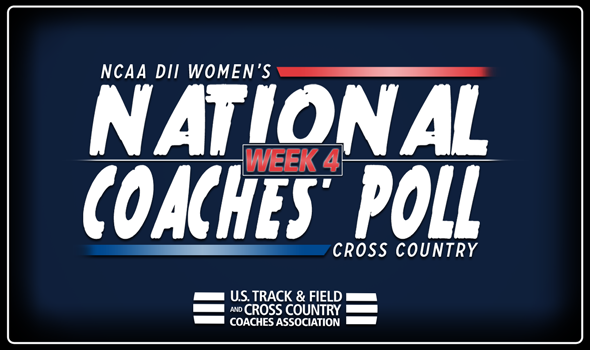 NEW ORLEANS – Big changes came in the middle portion of the NCAA Division II Women’s Cross Country National Coaches’ Poll in Week 4, released by the U.S. Track & Field and Cross Country Coaches Association (USTFCCCA) on Wednesday. Just two teams in the top-5 traded places however 13 teams saw movement between spots No. 10 and No. 25 which included two teams setting program records. Adams State remained as the top team in the nation for the fifth-straight week to open the year. The Grizzlies once again earned all eight first place votes and became the first team to start a year at No. 1 for the first five polls since Grand Valley State held the top spot for the entire season in 2014. Adams State will return to action with the Fort Hays State Tiger Open on Saturday. Improving one spot was No. 2 Western State after the group won the Lewis Conference Crossover Invitational this past weekend with a 38-point performance. The Mountaineers were led by Sophie Seward and second-place finisher Alicja Konieczek who each recorded a mark of 21:39.0. Trading spots with Western State was No. 3 Grand Valley State who found itself off from competition. The Lakers will be back on the course at the Jayhawk Invitational on Friday. Remaining at No. 4 was U-Mary who was also off from racing this past weekend. The program will return with the running of the NSIC Preview on October 20. Rounding out the top-five was No. 5 Colorado Mines who like the majority of the top teams also did not race this past weekend. The Orediggers will meet top-ranked Adams State at the Fort Hays State Open this weekend. No. 6 Augustana (S.D.) also had no change in rank and too was off from racing. The Vikings will be competing at the Wisconsin-LA Crosse Invitational on Saturday. Holding at No. 7 was Chico State who was also idle. The Wildcats will race again with the Bronco Invitational on Saturday. Staying pat at No. 8 was Alaska Anchorage who was off and will not be taking to the course this weekend. The program will return with the Western Washington Invitational on October 20. UC-Colorado Springs saw no change as well as it remained in the top-10 at No. 9. The team did run some athletes at the MSU Denver Roadrunner Invite this past weekend but will not go as a full-unit again until the RMAC Championships in early November. Rounding out the top-10 and improving one spot was No. 10 Simon Fraser after the group placed second at the Conference Crossover. The Clan were paced by Sophia Kaiser’s 10th-place finish. The middle of the rankings had some big movers with one of them being No. 11 Azusa Pacific. The Cougars shot up six spots from its previous rank to set a new program record for best mark ever received in the national poll. Right behind them at No. 12 was Seattle Pacific which had the biggest climb this week after a nine-spot improvement. It too set a school record for best mark received in program history. Another big gain belonged with No. 15 Pittsburg State that ascended eight spots in the poll. It is the best mark received for the program since the preseason. Queens (N.C.) was the only other team this week with improvement as it jumped two spots to No. 17. In total 15 of the previous top-25 teams had movement. The poll was unique in that six teams experienced positive gains compared to the nine teams that dropped from their previous position. The average improvement from the last poll made by teams was 4.5 spots while the average drop resulted in a loss of 4.0 spots. No. 14 Western Washington and No. 25 Saginaw Valley State were the two new programs to crack the top-25 this week. It is the first time Saginaw Valley has been ranked since 2014. Southwest Baptist, Cal State Stanislaus, Stonehill and Point Loma Nazarene also received votes.